SUNTECH-FH grades and WGA-15 are natural, fast hydrating guar gum for oil field applications. 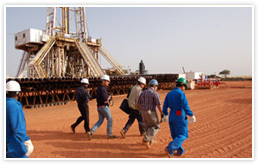 These products are mainly used in hydraulic fracturing. A hydraulic fracture is formed when a fluid is pumped down the well at high pressures for short periods of time (hours). The high pressure fluid (usually formed by aqueous swelling of specialty high viscosity fluid additives to form highly viscose fluid or gel) exceeds the rock strength and opens a fracture in the rock. A proppant, usually sand or other coarse particles carried by the high viscosity fluid of guar gum, is pumped into the fractures and the mixture fills the fracture. Proppants serves to keep the fracture open, creating a route for oil or gas to flow to the well bore. can be mixed continuously "on the fly"
In the recent days, cross-linkers (borax and other transitional metal ions) are being used to join or “link” two or more polymer chains, increasing viscosity. Cross linking increases SUNTECH-FH grades and WGA-15 resistance to hydrolysis at high temperature, effectively doubling the duration of its useful viscosity. Upon cross linking, the resultant fluid can handle high concentrations of proppant and provides increased fracture width and penetration. SUNTECH-FH grades are available in a range of Fann viscosities and particle size detailed specification sheets are available on request. Customized products can also be manufactured as per the requirement.